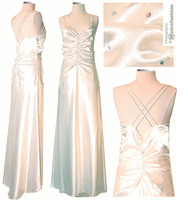 "Updated elegant evening gown in rich ivory color, with ruched bodice front and back. This dress is beaded in soft satin with popular neckline, perfect for bridal dress, prom dress, bridesmaid (see colors), evening events. Beadwork highlighted by small rhinestones throughout the bodice and waist. Spaghetti straps, V-neck front and back, ruched front and back with godet mini-train. Fully lined. Comes with matching wrap/shawl."